I jumped into this series without knowing that much about it. People were gushing and raving about this series everywhere and I just couldn't look pass it anymore, so I had to see what it's about. Kaylee is at the mall with her friend Emma and they're trying to figure out a revenge plan on Kaylee's ex as well as shop for homecoming. 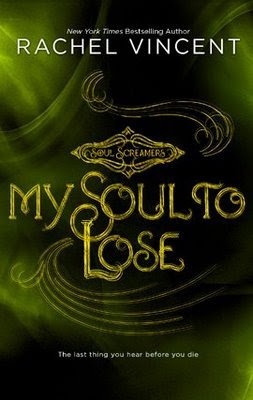 Then all of a sudden Kaylee feels the urge to scream the heck out of her, because she sees shadows creeping upon a child in a wheelchair and when she starts, she doesn't stop. The next time she's conscious Kaylee realizes she's been commited to a mental hospital. How did it happen and how, when and if she can leave is up for you to find out. The first half of the prequel was intriguing, but I couldn't read more than 5 pages tops every night. My eyelids grew as heavy as rock and I felt like this book didn't attract me at all. I found this whole situation rather confusing and this mental institution just pushed me away even more. However, after complaining about it on Goodreads, I gave myself a promise to finish this ASAP in order to finaly start the real book. I was glad I did, because as soon as I started reading it got interesting all of a sudden. The last ten pages were fantastic and I'm anxious to find out more. If it's anything like the second half of the prequel I'll read it with pure pleasure!